Graphics card is an ATI Radeon 9250, Windows XP. All drivers are current. DirectX is the current version. And it's worked fine on this comp before I installed WoG. At any rate, reinstalled all the drivers, defrag'ed the hard drive, same problem. C++ Runtime Error, points at the .exe file, then below that, says "abnormal program termination", then crashes to desktop. I'll try a complete erase and reinstall, but if that doesn't work... then I've got no clue. If that will fail then I will ask you to send a complete error message here. It may helps too. What all will you need, Pol? I'll send it wherever it needs to go. Arkas wrote: Enhanced Commander Artifacts can give their secondary skill to the Hero permanently. And it seems to break secondary skills (or maybe they are already broken, I'm not sure I'm relatively new to WOG). Does this happen for the newest version of the Enhanced Commander Artifacts script? I know in an update if it got enhanced to Expert and you removed the artifact it went back to Advanced. Can you still get the extra skills even if it gets set back to Advanced? After installation of the WoG-Script-Update I played a wogified map with Inferno; I built the castle gate within 2 towns, but instead of travelling between the towns I only can buy there war machines! Andrean wrote: After installation of the WoG-Script-Update I played a wogified map with Inferno; I built the castle gate within 2 towns, but instead of travelling between the towns I only can buy there war machines! Try to full reinstall or experimenting with used scripts in the wogification. I cannot see the image. Do creatures ressurected by the first aid tent after battle have their stack experience adjusted by the new creatures ressurected? If not, then I had a situation where my centaurs lost around 8000xp after the tent ressurected about 20 centaurs. In Evil Way Home, after changing my face to a human one in map 3, the hero's portrait becomes a messy picture when I load the game, and I receive a message the bitmap could not be found. I've installed the Sagamosa scripts and the script update, but nothing seemed to work. A lots of error messages came up during the loading sequence, and when I started to play no WoGification worked. What should I do to make the scripts work? Tips, help and hints would be great. If you click on the image, you get the full screenshot, containing also a graphic glitch (which didn't bother me at all actually - it disappears at the next move). The Sagamosa package is incompatible with almost everything. Use 3.58f +Script Update only. He's actually working on the 3.59 compatible version. Next version (build 10) will be out around the end of march. Version: 3.58f + script update. When I wogify a map I have a bug that prevent me spliting monster stacks in the heroes inventory. To split a stack, either I select a creature and I click on the split button, either I select the stack while holding shift. Both ways now fail. On the mousse button down event, the split button becomes enabled, but on mousse button up event it comes back greyed. I can split stacks in town screen or when 2 knights meet each other. It is a bit annoying to play with only one stack of monsters at the begining . A friend has not the problem, but if he loads a map I saved, he experiences the same issue. If I use a SOD map and don't wogify it it works perfectly... strange huh? I tested various combination of wog options but i'm not able to test all of them . An example file can be found here http://www.badongo.com/file/2448816 for a few days. 1) Sometime, my war machines disappear for no reason. Enhanced War Machines III is enabled and it usually happens when i have over 30-40 of them, although once i lost a battle because my only 2 first aid tents disappeared some time before that. 2) Commanders sometime do not give the war machines they are supposed to give. 4) Sometimes the game chrashes when i try to hire a high level hero with a lot of artifacts. The game shows an error message that begins with The latest ERM script activated and a part of the script, then shows a LOOOOOOOONG list of all kinds of numbers and although i know little about erm i can still tell it is definitely not a script. The same bug sometimes happens when i try to pick up artifacts someone has left on the ground. 5) Once quite long ago my stronghold army was strong enough to trample anything. Then, one day, this army lost its biggest stack (27000 wolf raiders) out of nothing. I ended my turn, it's all ok. I begin my next, look at my army and there are no wolf raiders when there were supposed to be these 27k. instead i was given 27 rogues. 6) I don't know why but i can not use erm to set a monster's cost to be in mithril (i tried to do dracolich - strengthened it very much, increased cost to 35000 gold and 5 mithril. Somewhy the game shows a bunch of error messages, but it actually boosts the power of dracolich and its gold cost. Mithril cost is not set, instead it continues to use 15 mercury. Version: 3.58f + script update , MP game . Playing with the option "9th 10th skill" , i got my 9th skill then equip my hero with a commander artifact that grant a basic skill . When i've got a level , i've got no choice to level up the skill of the commander artifact , just one choice -> increase the 9th skill . Then i go to my hero windows , check the additionial skills and got a CTD . Thanks for all your great works , playing in MP games in now wonderfull , Tcho ! Commander gets totally wrong resistance %, when gaining Magic Power skill by picking up Emerald of Speed. Seems to be a hardcoded bug with !!CO:B6. I'm not the only one, who have this problem. When I try to install allinon1.zip I get message about wrong .wog file. WoG Intallation ends at 6%. Yes, I can unrar all .wog files, i.e. archives seem not damaged. I've downloaded allinon1.zip from different locations and got the same error. I tried to put those .wog (main1.wog, main2.wog etc) files to UPDATE folder and run H3wUpd.exe (extracted from main2). I also tried to run H3wUpd.exe when in UPDATE folder were not .wog files, but extracted (from .wog) files (i.e. there were folders main1, main2, etc.) and the I got message that there is no .wog files in UPDATE folder. But I could't install even 3.5 (I have only install.zip, is it a whole WOG v3.5 ?). Please tell me, is there anyone on this planet, who have installed WoG on Heroes 3 Complete using allinon1.zip ? 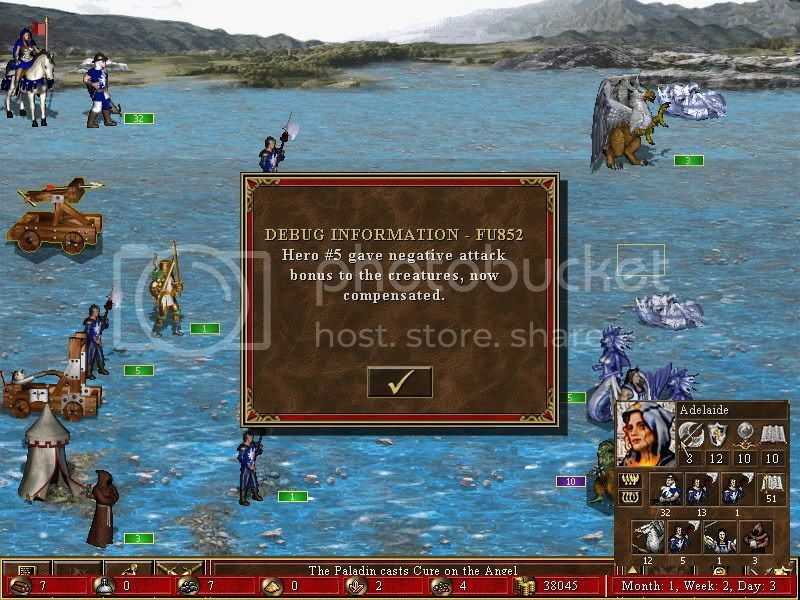 Robertukas wrote: Please tell me, is there anyone on this planet, who have installed WoG on Heroes 3 Complete using allinon1.zip ? I did it. First on WinXP, after that on Linux. Works propely. I really don't know, what is the problem. Try to reinstall Windows? Really, what was giving you problems? Can you mention them?